A few years ago, I remember reading an article in a parenting magazine about a mom who tried to eat what her kids ate (for a day? a week? I honestly can't remember.) For the duration of this experiment, her diet consisted of things like macaroni and cheese, chicken nuggets, and goldfish crackers. Strangely enough, she basically concluded that this was a horrible diet- for her --- with little (if any?) mention of the fact, that maybe it wasn't so great for her kids either. At the time, I remember thinking that if I ate like my kids, I'd be much better off. Here's why: I feed my kids better than I feed myself. Yep. I'm pretty much a hypocrite. I was even worse when I first read the article. I've gotten much better thank to having gestational diabetes during most of my 4th pregnancy, and also due to the fact that I cut out wheat about 8 months ago. But still, I will insist that my kids snack on carrots and apples while secretly inhaling a handful of chocolate chips. I feed my kids a high protein, low sugar breakfast, while enjoying my own breakfast of champions: coffee. I don't really eat a lot of "junk food," because I don't have it in the house… but I don't regularly eat all of the good foods that I insist that my kids eat either. While some days, I do pretty well, other days I simply graze until dinner time. Since I'm all about experiments lately, I decided to do another: I would to try to eat like my kids all day long. I've always had a hard time eating first thing in the morning. However, since my kids eat as soon as they wake up- on this day, I did too. I had a slight advantage because my kids had a snow day which meant that breakfast started at a little later than usual. First up- a smoothie (banana, frozen organic strawberries and blueberries-from Aldi, almond milk, and chia.) I have always insisted that I just couldn't handle all that sweetness in the morning. Not only did I drink it, no problem, but I really enjoyed it! Next, my kids had their standard "egg-toast" with guacamole. Since I don't eat bread, I had two eggs, guac, and some blackberries. On days that he doesn't go to preschool, my 4 year old asks for food all morning. For the past few days, I've reminded him that at school, he doesn't eat until snack-time and is therefore not starving… so, I've done this- and it works... mostly. Also, since the kids have been begging for chocolate, I bought some chocolate almond milk, which I heated up and then topped with whipped up coconut milk and 2 mini marshmallows. For lunch, the kids had apples with cashew butter (the 4 year old wanted apple "donuts" with cashew butter and raisins inside) and turkey and guacamole or ham and mustard sandwiches. Again, since the baby and I don't eat wheat, I made guacamole and ham quesadillas on corn tortillas. I actually sat down and ate with the kids! Before nap/ rest time, a few of the kids finished their sandwiches from earlier, so I joined in and finished my son's quesadilla. Naptime was a struggle. Normally, this is when I eat. Until nap time, it's go-go-go, and I often forget to eat. I then suddenly realize that I'm starving. On this day, even though I had been eating all morning, I still wanted to eat. After our carrots, our fruit leather (which I made way too thin) and our dried pineapple were done, so we ate all of the fruit leather and three and a half trays of dried pineapple. However, the class was, to the huge disappointment of my daughter, cancelled- so we joined everyone else for chicken legs cooked with bacon, sweet potatoes and broccoli. Don't let the tiny plate fool you. The large dishes were still in the dishwasher because the (almost) 2 year old restarted it about 5 times today, so we had to use the little ones. I did only have one chicken leg (not my favorite part of the chicken) but I ate at least 3 times the amount of veggies shown. 1) We would not survive around here without apples, guacamole and hummus. 2) I can eat and enjoy breakfast. I just need to make an effort to do so. 3) I like smoothies… even first thing in the morning. 4) This experiment made me think about food all day, which made me think that I was hungry all day. It was really hard not to just grab something whenever I wanted to. 5) When I ate like my kids, I drank more water! I usually don't realize that I'm thirsty until evening. 7) I didn't want to eat carrots--- but I ate them anyways because I didn't have a choice. 8) When my kids say they are "starving," they may be hungry, or they may be bored. I'm still not sure if I was really as hungry as I thought I was yesterday, or if I just wanted food all day because I knew I couldn't have it. Do you eat like your kids? If you did, would it be a good thing or a bad thing?? This post is linked up to What I Ate Wednesday and since I ended up with so many pictures, I'm joining Jessica in (not quite) "Wordless" Wednesday. Thank you so much for your kind comment, Julie! In my house we wouldn't survive without apples or hummus as well. My kids eat hummus 3-4 times a day. Sometimes even by itself with a spoon. I never get a chance to eat with my kids either (regardless of the fact that I'm always at home with them), because meal time always seems to be so chaotic. But the rare time that I do, I always think that I should do so more often. What a wonderful experiment! I love that all of your snacks were so healthy (and fun! Apple doughnuts!) I know i'm a chocolate chip muncher! I loved this article! I find myself skipping breakfast or not packing myself a lunch for work (and then eating snacks I can scrounge up instead for lunch) far too often, while I make sure my kids eat breakfast and have a packed lunch for school! We need to make sure we take care of ourselves, too. Your family eats great! Thanks Erin... I must admit, this is still a work in progress--- I am definitely more aware now and every time I see the article it is a reminder! I always fed my child much better than I fed myself--unless I actually sat down and ate dinner WITH him. In fact, whenever he was away visiting relatives, he would telephone me and ask me if I ate a healthy meal (not chocolate cake and milk). I enjoyed this post immensely! What a thought-provoking idea… everyone eating the same thing. Novel! :-) It would certainly cut down on my time in the kitchen not to make all these different dishes…Thanks! Such a great idea. I will have to try this sometime. I love that you ate like a 4 year old. This is such a great read! You gave me some good snack ideas to offer my daughter & son. Sometimes you just get in a snack rut! My sis will enjoy this. I'll be sure to share. Thanks for making me laugh today! I'm guilty of hiding chocolate from my kids! I really loved this recap of your eating for the day. What a neat experiment! I really liked how you provided some non-wheat alternative ideas because I've been thinking of going wheat free but feel so overwhelmed trying to figure out what has wheat and what doesn't. All of your suggested alternatives are things I already do so score for pushing me to the kitchen straight away to make some good choices. While I want to go wheat free, the rest of my household doesn't so it's good to see options on both sides of the spectrum. As as aside, I don't have kids, but I've always thought that if I ate as well as my dogs. I had one with canine renal failure. BEcause of her condition, I actually had to make her food which consisted of a lot of all organic (she couldn't process pesticides - but then again none of us can) produce, nuts, seeds and grains. I would spend $100 a week on all of that at an organic fru-fru store and then make crappy decisions for myself over at GRocery Outlet. The where doesn't matter, but the choices do. So easy to eat better if you just plan for it and make the choice. Thank you so much for your thoughtful response Bernadette! Going wheat-free can be totally overwhelming. In fact, I've had to cut a lot of things from my diet over the years and I put off cutting out wheat forever because I thought I couldn't do it! For me, it has made a huge impact in how I feel which has made it much easier to stick with it. I find that it's much easier to eat things that you already have, or already eat, rather than trying to find a bunch of wheat-free alternatives (I don't tend to handle those well either anyways.) However, there are still days when I stare in my pantry or in my fridge and think, "What in the world am I going to eat??!!" Eggs, guacamole, hummus, carrots, apples and cashew butter are my fallbacks--- nuts, raisins, and chocolate chips are my "quick fixes!" I think that most of us take better care of those we love (including our pets) than we do ourselves. I loved your post - I smiled all the way through :-)! I never ate breakfast before going gluten free - the whole "food in the morning - yuck" but now I do eat an apple each morning with my coffee and have learned to drink smoothies as a mid-morning snack, or for lunch. This week my daughter even added spinach to our strawberry, banana smoothies. I just really wish eating better foods didn't require so much time in the kitchen fixing, then cleaning up :-). Julie, I cannot believe how much I can relate to this!! Not that I've done this experiment, but that I'm usually a crap eater compared to what I serve my kids. Also, I'm trying to give up wheat and overall I'm going to make a huge effort to avoid sugar -- not just for them (easy to reinforce), but with MYSELF (terrible at reinforcing). I do have a subscription to Super Healthy Kids and they have pretty good stuff. I'm just not consistent. Besides chicken nuggets, I feel like my kids eat better than I do also! I find myself grabbing random meals while theirs are much more well rounded and healthy! I have been trying to make an effort to eat breakfast too. I have found that berries are easy to eat in the car on the way to work. I really enjoyed this. No kiddos for me yet, but I am trying really hard to focus more on eating whole foods instead of processed snacks. A hunk of cheese is NOT breakfast. I love the way you feed your kids! So many people don't realize it is just as easy to feed them healthy, nurturing food instead of processed stuff. Everyone should take advice from this post! What a fun experiment! I'm guilty too of making my kids snack on fruit and veggies while I sneak in some chocolate! I'm better now and we all eat quite healthily! It would depend on the day on whether I would want to eat like my kids as they love oatmeal for breakfast, and I prefer my Greek yogurt with fruit. Also, they love PBJ sandwiches whereas I prefer a large salad with egg and cheese. For dinner, we are all on the same page though I load up on the veggie more so than they do. Sounds like you enjoyed your experiment and were able to adjust as needed. Your kids are such great eaters. I wish I could teach my daughter how to eat like that. After reading your post, I realized that I need to reevaluate the way I feed my kid. I’m not so much of a good role model, perhaps that is why my daughter is such a picky eater. I feel ashamed for some of the things we eat after reading this post. I have a 2 year old and he's such a picky eater. I feel like sometimes I make 10 different things just trying to get him to try something. Sounds like you have everything under control! Oh please don't feel ashamed!! Our eating has changed so much over the years and much of it has been against my will ;) (Thanks to food sensitivities, allergies, and gestational diabetes!) Two year olds are so challenging and will be picky by nature... they also are fickle and will eat a lot one day and not the next or eat a lot for a month and then hardly at all the next month. Try to not to worry about it too much. If you read this comment, please send me an email info (AT) teachinggoodeaters.com because I'd like to help but it's too much to write here!! I loved this post! You're doing a wonderful job teaching your kids how to eat healthy from a young age. Good job! What a fun experiment! Your family eats really healthy. I don't have kids yet, but I'm kinda like you. Coffee for breakfast, then starving for lunch. Thanks for the fun, and inspiring post. I loved your post and your writing style! My kids generally eat better than me. They eat lots of veggies and fruits and usually steal mine. And I am glad to know that I am not the only one with a 4 year old that thinks he is starving all morning, haha. I was totally immersed in reading this! I have two healthy eaters and one selective eater who is more like me. I tend to have just coffee for breakfast just like you and I often forget to eat until I hear my tummy grumble some time after noon. I look forward to reading more posts! Wonderful! So glad that you are taking the time to eat healthy! I can totally relate as I would do the exact same thing for many years! I thank the Lord I got past it. It's great to see a Mamma taking the time for herself and her children. 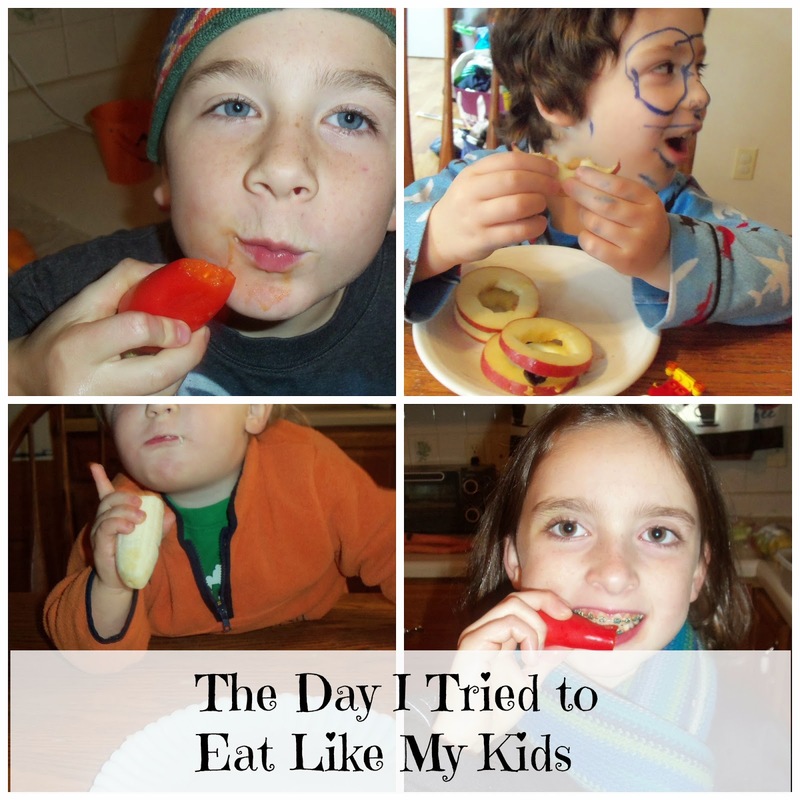 I do eat like my kids now--it was a goal that my husband and I set for the new year. Your meals and snacks sound a lot like mine, Kudos to you for taking on this challenge. It was a great read. Loved this! Such a window into real life for most of us with kids. We usually eat breakfast and dinner the same, but lunch is usually a tossup and eating leftovers. When budget was tight for awhile, I made sure the kids had fruit and I usually did without. Now I am learning to adjust all our meals so we (try to!) all eat more healthy and well-rounded without breaking our food budget. And my weight-loss and everyone's regularity is an encouragement to keep it up! What a fun experiment. My kids are older, so what I have found is that I tend to eat better when we eat together because I am much more focused on making sure that they have balanced meals and less likely to do so with myself- which is crazy. Your post is a good reminder that we need to also focus on ourselves as well. If I would stop being lazy when it comes to preparing meals, I would eat much healthier. I wish I could just hire a cook to make me healthy meals every day. Haha. I do want to eat healthier, but usually run out of ideas (or money) for healthy options. I need to bookmark this post & take your suggestions. My kids are older teens now so food has become a real free-for-all. But I always tried to eat the same as they did because then it was more likely that they would eat it. If I ate something different then they might question why. Grazing was always my problem and I've always hated breakfast. Mornings are busy as everyone runs to different things. I've found a lot of success with smoothies. I add soy yogurt and also soy protein powder to almond or coconut milk and berries. Very quick and now I look forward to them. I loved the photos in this post! Your kids are adorable. My son is 11 months old and we are doing baby led weaning, which essentially means he eats what we eat. No special foods or purees. This has helped us make more organic and whole food choices and eliminated a lot of gluten from my diet. We still have room for improvement though. At 11 months, he still doesn't catch every sneak of mine in the kitchen for something not-so-healthy. There is going to be a day I'm not going to be able to get away with that so easily. Interesting experiment! However, if I eat like my boys I will be a lot bigger because meals mostly consist of rice and viand, even for snacks. Since they are very active they convert rice into energy, maybe if I can be as active as them there will be no problem. Love this post! Thanks for your response Amy! I still struggle with this... it's so hard not to dig into the chocolate when the kids go to bed. For me the only thing that seems to work is not having it in the house!